We all know that Samsung is prepping to release their budget-friendly series, Galaxy M Series to conquer the low-end market. 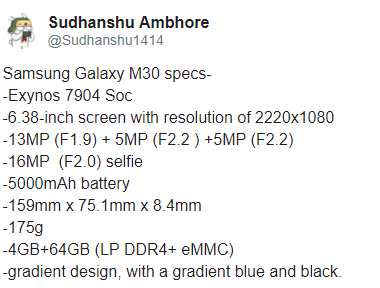 There had been a lot of rumors about the Galaxy M series that includes M10, M20 & M30. 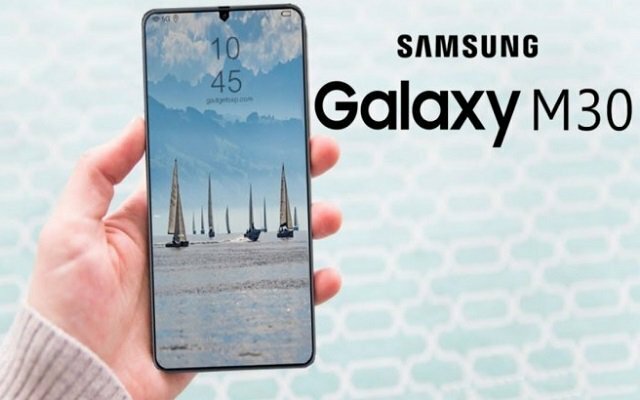 Recently, Galaxy M30 Specs got leaked hinting that the upcoming phone will be a good option for the people who want mid-ranged phones. According to the leak, the upcoming Samsung Galaxy M30 will be 159mm long by 75.1mm wide. The flagship phone will feature a 6.38-inch Infinity-V AMOLED screen with FHD+ resolution. Moreover, the upcoming phone will be powered by an Exynos 7904 CPU. One of the most noticeable features is that the M30 will come with 6GB of RAM. In addition to that, it will come with 128GB of internal storage. One of the main features of the Galaxy M30 will be its powerful 5000 mAh battery. There will also be a USB-C port at the bottom. The Galaxy M30 is tipped to sport a triple rear camera setup. There will be three sensors including the 13MP (F1.9) + 5MP (F2.2 ) +5MP (F2.2) at the rear. On the other hand, there will be a 16MP (F2.0) selfie shooter at the front. In addition to all this, the device is also rumored to feature a gradient design available in gradient blue and black. Moreover, M30 will also sport a rear-mounted fingerprint scanner. The Galaxy M30 expected price in Pakistan is PKR 40,999. The phone is expected to see the light on Feb 27.